Quality Management enabling MLPE Innovations to scale Globally while Driving Sustainable Profitability. 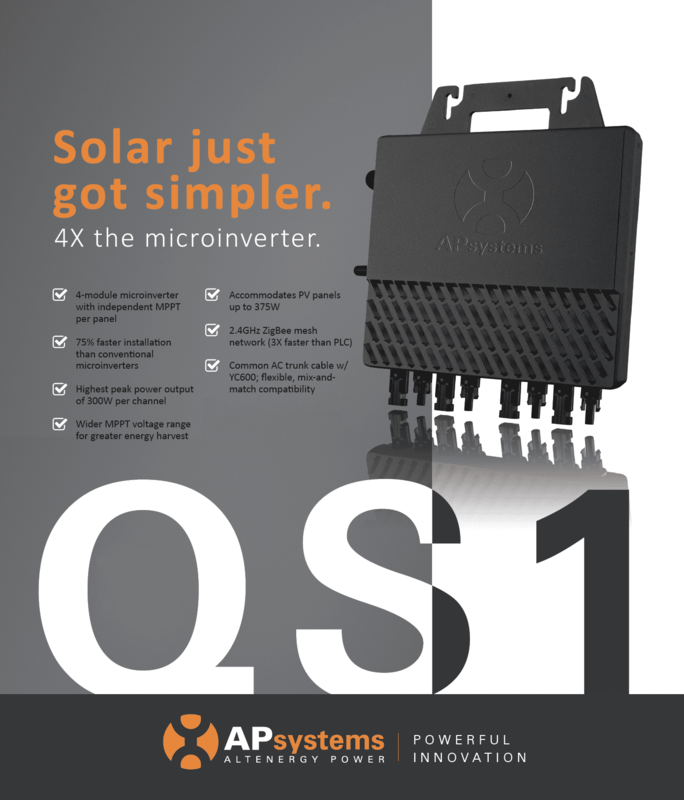 APsystems (Altenergy Power Systems) is a global leader in microinverter technology development & manufacturing serving the photovoltaic Industry. 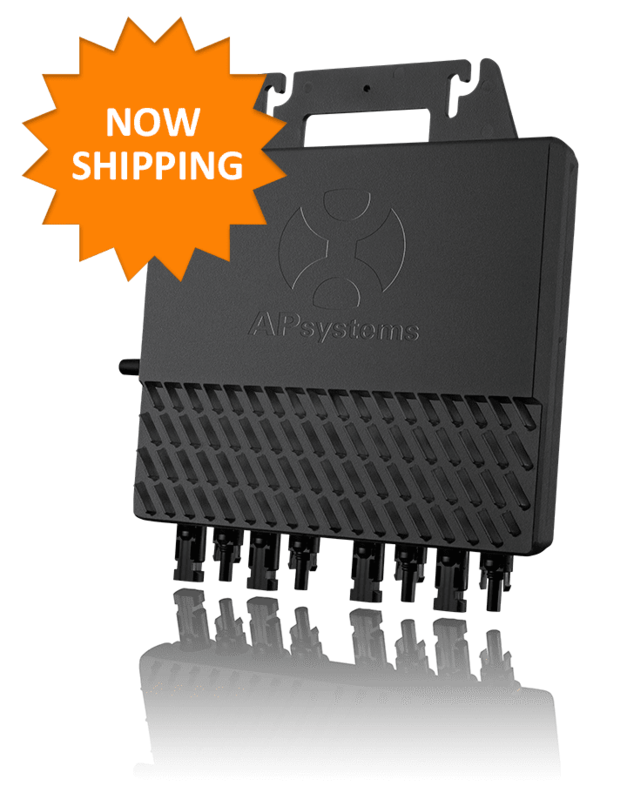 In 2014 and 2015 APsystems ranked no.2 in global market share among microinverter suppliers in units shipped and is the world’s third largest vendor of Module Level Power Electronics (MLPEs) for the solar industry (source: GTM Research). The company has experienced steady growth every year since being founded in Silicon Valley in 2009 and has been profitable since 2012. 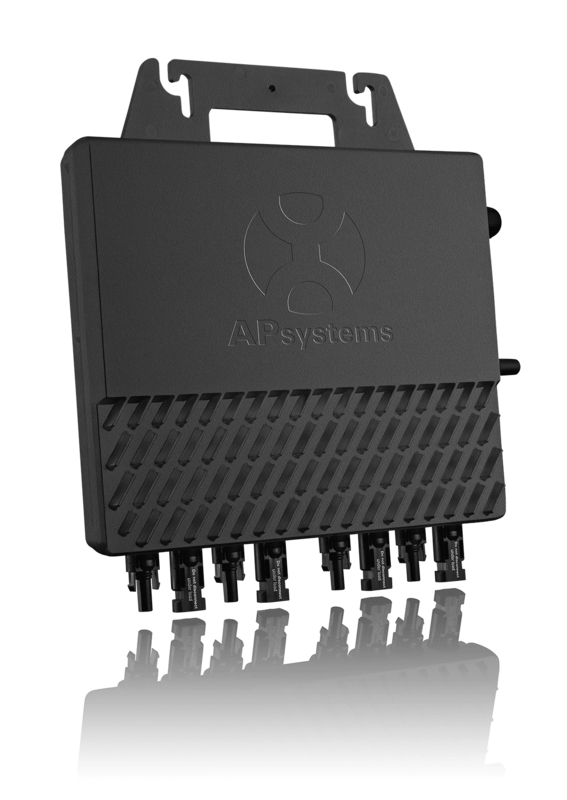 APsystems is the largest microinverter supplier to China and Australia, and is no.2 in the US and the European regions, increasing its market share dramatically through a robust distribution network worldwide. This paper describes the crucial aspects of quality control and management taken by APsystems to achieve industry leading standards and scaling its operations globally while improving its financial performance year on year. Find out more by downloading the full White Paper in English here. French version also available for download here . 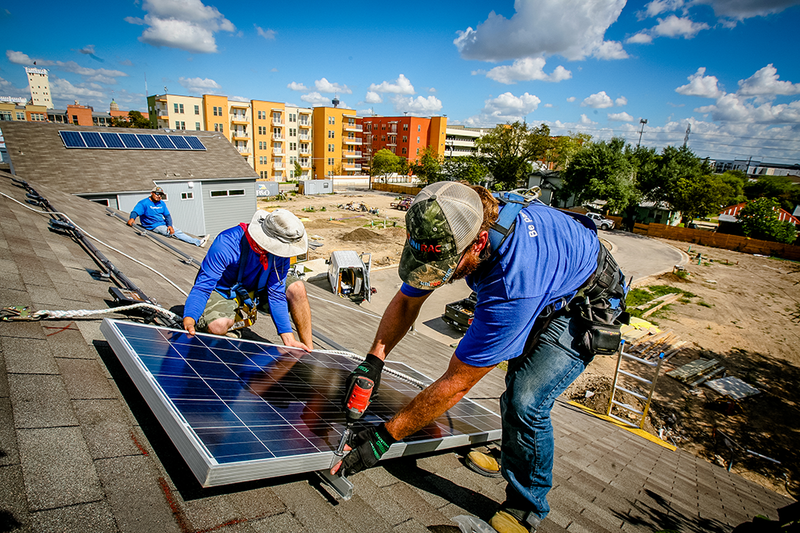 When it comes to solar growth, it doesn’t get much hotter than San Antonio. The market ranked no. 6 nationally for metropolitan growth in 2015, and no. 7 for the spread of solar, setting the pace for the Lone Star State. Those trends converge at 330 Clay Street, a 32-home planned-solar neighborhood by PSW Real Estate now underway in the San Antonio’s arts and culture district, at the south edge of downtown. Billed as “an oasis in the heart of the city,” the New Urbanism-inspired project features geometrically distinct homes clustered around a winding pedestrian path and drought-friendly, native vegetation. The modern designs are stylish, with acute angles, dramatic roof slopes, and accents of corrugated metal and cedar. Efficiency features abound, from eco-friendly siding to high-performance windows, tankless water systems with “smart” fixtures, and the latest heat-pump systems for indoor climate control. Sustainable, low-impact materials are used throughout. Topping it off is solar, with a compact array designed onto every single roof. 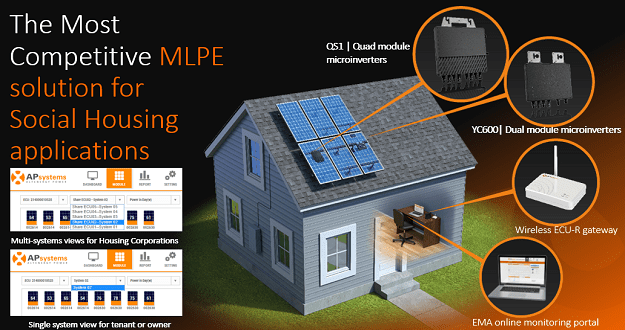 Austin-based installer Lighthouse Solar is pairing APsystems YC500 dual-module microinverters with Phono Sun 310W modules. Capacity across the whole neighborhood will be about 73kW from 234 modules at buildout. Lighthouse chose APsystems equipment on the recommendation of regional distributor The Power Store, said Burke Ruder, procurement manager. 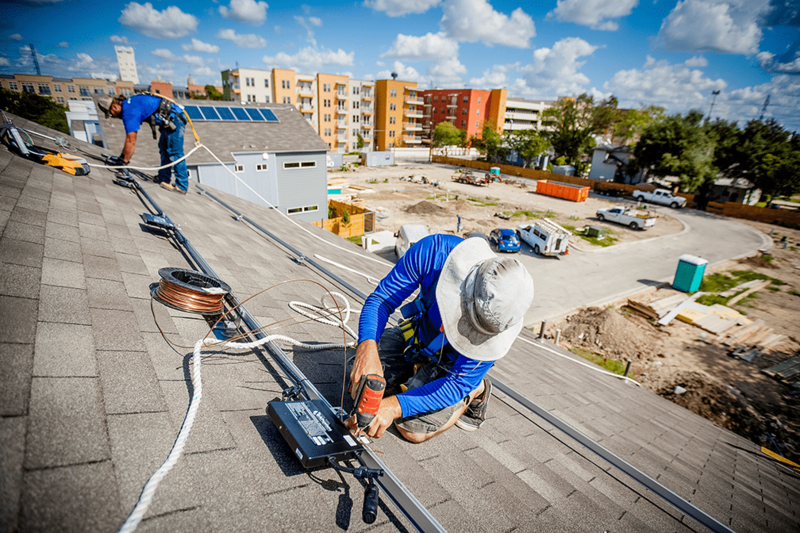 The Lighthouse installation team found the dual-module microinverters made for a quick install, and less time on the roof under the punishing Texas sun. “Pretty easy wire management – just plug n’ play, man,” said Josh Bernard, one of the three-man crew at Clay Street. Elijah Zane Echeveste, PSW Real Estate sales consultant for San Antonio, said PSW has been including a solar component on its homes for about three years. 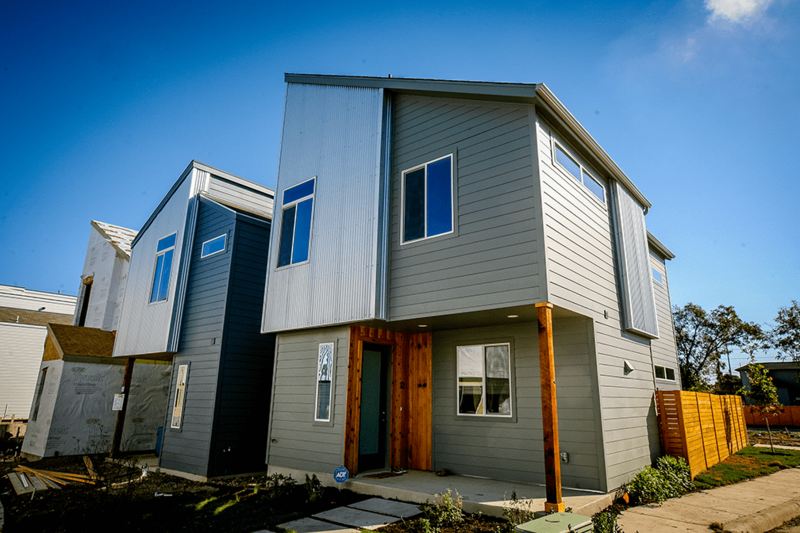 Individual arrays at 330 Clay Street are modest – seven or eight modules per roof – putting solar onto every home while keeping price points attractive to a range of buyers. Home start at $295,000 for 1,250-sf, two-bedroom unit. The energy package is paying off in early interest from buyers. “Solar was important, and green-built was important,” said David McDonald, 330 Clay Street’s very first resident. On a recent afternoon, the expatriate Briton was taking delivery of appliances even as the half-finished neighborhood around him thrummed with the sounds of construction. Several other projects are also planned or underway in the corridor, including a sprawling former Lone Star brewery complex slated for mixed-use redevelopment on the banks of the San Antonio River. The influx of stylish new residential and commercial development amplifies Southtown’s reputation as the city’s hot “bohemian” center for galleries, nightlife and culture. The 330 Clay Street project reflects a fast-growing local solar market. San Antonio is the top-ranked market in Texas, according to a recent report by Environment America. Solar capacity within the city limits jumped 23 percent year over year, from 88 megawatts to 108 megawatts – with significantly more capacity coming online in surrounding areas thanks to utility-scale solar farms. About 207 megawatts were installed statewide in 2015, according to Environment Texas. Solar advocates credit a successful incentive program, which has fed consumer interest despite the state not having a net-metering law. 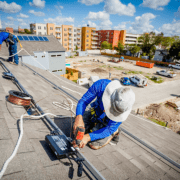 APsystems acknowledges installer’s commitment to Solar Power and offers solar professionals the opportunity to improve their technical skills in order to stand out from competition. A full range of seminars and live webinars are available for our customers to register for free. Each seminar or webinar is led by a dedicated APsystems product trainer in your local language. 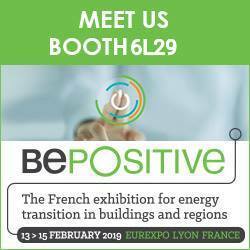 Don’t miss the opportunity to discover a new range of Microinverters systems ideal for self-onsumption, residential or commercial solar arrays. Go on APsystems training page here and register to the session that suits you most. To view this news in French, click here. To view this news in Dutch, click here.